Not to be confused with Australian Special Air Service Regiment, Canadian Special Air Service Company, New Zealand Special Air Service, or Rhodesian Special Air Service. "The Regiment" redirects here. For other uses, see The Regiment (disambiguation). The corps currently consists of the 22nd Special Air Service Regiment, the regular component under operational command of United Kingdom Special Forces, as well as the 21st (Artists) Special Air Service Regiment (Reserve) and the 23rd Special Air Service Regiment (Reserve), which are reserve units under operational command of the 1st Intelligence, Surveillance and Reconnaissance Brigade. The Special Air Service traces its origins to 1941 and the Second World War. It was reformed as part of the Territorial Army in 1947, named the 21st Special Air Service Regiment (Artists Rifles). The 22nd Special Air Service Regiment, which is part of the regular army, gained fame and recognition worldwide after its televised rescue of all but one of the hostages held during the 1980 Iranian Embassy siege. The Special Air Service was a unit of the British Army during the Second World War that was formed in July 1941 by David Stirling and originally called "L" Detachment, Special Air Service Brigade—the "L" designation and Air Service name being a tie-in to a British disinformation campaign, trying to deceive the Axis into thinking there was a paratrooper regiment with numerous units operating in the area (the real SAS would "prove" to the Axis that the fake one existed). It was conceived as a commando force to operate behind enemy lines in the North African Campaign and initially consisted of five officers and 60 other ranks. Its first mission, in November 1941, was a parachute drop in support of the Operation Crusader offensive. Due to German resistance and adverse weather conditions, the mission was a disaster; 22 men, a third of the unit, were killed or captured. Its second mission was a major success. Transported by the Long Range Desert Group, it attacked three airfields in Libya, destroying 60 aircraft with the loss of 2 men and 3 jeeps. In September 1942, it was renamed 1st SAS, consisting at that time of four British squadrons, one Free French, one Greek, and the Folboat Section. In January 1943, Colonel Stirling was captured in Tunisia and Paddy Mayne replaced him as commander. In April 1943, the 1st SAS was reorganised into the Special Raiding Squadron under Mayne's command and the Special Boat Squadron was placed under the command of George Jellicoe. The Special Raiding Squadron fought in Sicily and Italy along with the 2nd SAS, which had been formed in North Africa in 1943 in part by the renaming of the Small Scale Raiding Force. The Special Boat Squadron fought in the Aegean Islands and Dodecanese until the end of the war. In 1944 the SAS Brigade was formed from the British 1st and 2nd SAS, the French 3rd and 4th SAS and the Belgian 5th SAS. It was tasked with parachute operations behind the German lines in France and carried out operations supporting the Allied advance through France, (Operations Houndsworth, Bullbasket, Loyton and Wallace-Hardy) Belgium, the Netherlands (Operation Pegasus), and eventually into Germany (Operation Archway). As a result of Hitler's issuing of the Commando Order on 18 October 1942, the members of the unit faced the additional danger that they would be summarily executed if ever captured by the Germans. In July 1944, following Operation Bulbasket, 34 captured SAS commandos were summarily executed by the Germans. In October 1944, in the aftermath of Operation Loyton another 31 captured SAS commandos were summarily executed by the Germans. At the end of the war the British government saw no further need for the force and disbanded it on 8 October 1945. The following year it was decided there was a need for a long-term deep-penetration commando unit and a new SAS regiment was to be raised as part of the Territorial Army. Ultimately, the Artists Rifles, raised in 1860 and headquartered at Dukes Road, Euston, took on the SAS mantle as 21st SAS Regiment (V) on 1 January 1947. In 1950, a 21 SAS squadron was raised to fight in the Korean War. After three months of training in Britain, it was informed that the squadron would no longer be required in Korea and so it instead volunteered to fight in the Malayan Emergency. Upon arrival in Malaya, it came under the command of "Mad Mike" Mike Calvert who was forming a new unit called the Malayan Scouts (SAS). Calvert had already formed one squadron from 100 volunteers in the Far East, which became A Squadron—the 21 SAS squadron then became B Squadron; and after a recruitment visit to Rhodesia by Calvert, C Squadron was formed from 1,000 Rhodesian volunteers. The Rhodesians returned home after three years service and were replaced by a New Zealand squadron. By this time the need for a regular army SAS regiment had been recognised; the 22nd SAS Regiment was formally added to the army list in 1952 and has been based at Hereford since 1960. In 1959 the third regiment, the 23rd SAS Regiment, was formed by renaming the Reserve Reconnaissance Unit, which had succeeded MI9 and whose members were experts in escape and evasion. Since serving in Malaya, men from the regular army 22 SAS Regiment have taken part in covert reconnaissance and surveillance by patrols and some larger scale raiding missions in Borneo. An operation against communist guerillas included the Battle of Mirbat in the Oman. They have also taken part in operations in the Aden Emergency, Northern Ireland, and Gambia. Their Special projects team assisted the West German counterterrorism group GSG 9 at Mogadishu. The SAS counter terrorist wing famously took part in a hostage rescue operation during the Iranian Embassy Siege in London. During the Falklands War B squadron were prepared for Operation Mikado before it was subsequently cancelled while D and G squadrons were deployed and participated in the raid on Pebble Island. Operation Flavius was a controversial operation in Gibraltar against the Provisional Irish Republican Army (PIRA). 22 SAS also directed NATO aircraft onto Serb positions and hunted war criminals in Bosnia. They were also involved in the Kosovo War helping KLA guerillas behind Serbian lines. According to Albanian sources one SAS sergeant was killed by Serbian special forces. 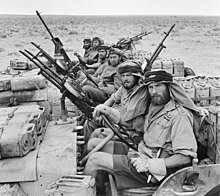 The Gulf War, in which A, B and D squadrons deployed, was the largest SAS mobilisation since the Second World War, also notable for the failure of the Bravo Two Zero mission. In Sierra Leone it took part in Operation Barras, a hostage rescue operation, to extract members of the Royal Irish Regiment. Following the September 11 attacks on the United States by al-Qaeda in 2001, 2 squadrons of 22 SAS, reinforced by members of both the territorial SAS units deployed to Afghanistan as part of the Coalition invasion at the start of the War in Afghanistan (2001–present), to dismantle and destroy al-Qaeda and to deny it a safe base of operations in Afghanistan by removing the Taliban from power in the War on Terror. The Regiment carried out Operation Trent – the largest operation in its history, which included its first wartime HALO parachute jump. Following the invasion, the Regiment continued to operate in Afghanistan against the Taliban and other insurgents until 2006, where its deployment Iraq became its focus of operations until 2009, when the SAS redeployed to Afghanistan. The regiment took part in the Iraq War, notably carrying out operations in Iraq before the 2003 invasion. Following the invasion, it formed part of Task Force Black/Knight to combat the postinvasion insurgency; in late 2005/early 2006, the SAS were integrated into JSOC and focused its counterinsurgency efforts on combating al-Qaeda in Iraq and the Sunni insurgency alongside Delta Force. The counter-insurgency was successful, and the UKSF mission in Iraq ended in May 2009. Various British newspapers have speculated on SAS involvement in Operation Ellamy and the 2011 Libyan civil war. The Daily Telegraph reports that "defence sources have confirmed that the SAS has been in Libya for several weeks, and played a key role in coordinating the fall of Tripoli." While The Guardian reports "They have been acting as forward air controllers—directing pilots to targets—and communicating with NATO operational commanders. They have also been advising rebels on tactics." Members of the Special Air Service were deployed to Northern Iraq in late August 2014, and according to former MI6 chief Richard Barrett, would also be sent to Syria, tasked with trying to track down the Islamic State of Iraq and the Levant (ISIL) terrorist group that the press labelled the Beatles. In recent years SAS officers have risen to the highest ranks in the British Army. General Peter de la Billière was the commander in chief of the British forces in the 1990 Gulf War. General Michael Rose became commander of the United Nations Protection Force in Bosnia in 1994. In 1997 General Charles Guthrie became Chief of the Defence Staff the head of the British armed forces. Lieutenant-General Cedric Delves was appointed commander of the Field Army and deputy commander in chief NATO Regional Headquarters Allied Forces North in 2002–2003. Following the post-war reconstitution of the Special Air Service, other countries in the Commonwealth recognised their need for similar units. The Canadian Special Air Service Company was formed in 1947, being disbanded in 1949. The New Zealand Special Air Service squadron was formed in June 1955 to serve with the British SAS in Malaya, which became a full regiment in 2011. Australia formed the 1st SAS Company in July 1957, which became a full regiment of the Special Air Service Regiment (SASR) in 1964. On its return from Malaya, the C (Rhodesian) Squadron formed the basis for creation of the Rhodesian Special Air Service in 1961. It retained the name "C Squadron (Rhodesian) Special Air Service" within the Rhodesian Security Forces until 1978, when it became 1 (Rhodesian) Special Air Service Regiment. Non-Commonwealth countries have also formed units based on the SAS. The Belgian Army's Special Forces Group, which wears the same capbadge as the British SAS, traces its ancestry partly from the 5th Special Air Service of the Second World War. The French 1st Marine Infantry Parachute Regiment (1er RPIMa) can trace its origins to the Second World War 3rd and 4th SAS, adopting its "who dares wins" motto. The American unit, 1st Special Forces Operational Detachment-Delta, was formed by Colonel Charles Alvin Beckwith, who served with 22 SAS as an exchange officer, and recognised the need for a similar type of unit in the United States Army. The Israeli Sayeret Matkal has also been modelled after the SAS, sharing its motto. Ireland's Army Ranger Wing (ARW) has also modelled its training on that of the SAS. The Philippine National Police's Special Action Force was formed along the lines of the SAS. Little publicly verifiable information exists on the contemporary SAS, as the British government usually does not comment on special forces matters due to the nature of their work. The Special Air Service comprises three units: one Regular and two Army Reserve (AR) units. The regular army unit is 22 SAS Regiment and the reserve units are 21 Special Air Service Regiment (Artists) (Reserve) (21 SAS(R)) and 23 Special Air Service Regiment (23 SAS (R)), collectively, the Special Air Service (Reserve) (SAS(R)). Boat troop – specialists in maritime skills including diving using rebreathers, using kayaks (canoes) and Rigid-hulled inflatable boats and often train with the Special Boat Service. Air troop – experts in free fall parachuting and high altitude parachute operations including High Altitude Low Opening (HALO) and High Altitude High Opening (HAHO) techniques. Mobility troop – specialists in using vehicles and are experts in desert warfare. They are also trained in an advanced level of motor mechanics to field-repair any vehicular breakdown. Mountain troop – specialists in Arctic combat and survival, using specialist equipment such as skis, snowshoes and mountain climbing techniques. 22 SAS squadron duty rotations are set up as such that one squadron is maintained on Counter Terrorism duty in the UK; a second will be on a deployment; a third will be preparing for deployment whilst conducting short term training; and the fourth will be preparing for long-term overseas training such as jungle or desert exercises. In times of war, such as the 2003 invasion of Iraq, it's not uncommon for two squadrons to be deployed. The special projects team is the official name for the Special Air Service anti–hijacking counter–terrorism team. It is trained in Close Quarter Battle (CQB), sniper techniques and specialises in hostage rescue in buildings or on public transport. The team was formed in the early 1970s after Prime Minister Edward Heath asked the Ministry of Defence to prepare for any possible terrorist attack similar to the massacre at the 1972 Summer Olympics therefore ordering that the SAS Counter Revolutionary Warfare (CRW) wing be raised. Squadrons refresh their training every 16 months, on average. The CRW's first deployment was during the Balcombe Street Siege. The Metropolitan Police had trapped a PIRA unit; it surrendered when it heard on the BBC that the SAS were being sent in. The first documented action abroad by the CRW wing was assisting the West German counter-terrorism group GSG 9 at Mogadishu. In 1980, the SAS were involved in a dramatic hostage rescue during the Iranian Embassy Siege. The CT role was shared amongst the squadrons, initially on a 12-month and later six-month rotation basis to ensure that all members are eventually trained in CT and CQB techniques. The SAS train for the CT role at Pontrilas Army Training Area in a facility that includes the Killing House (officially known as Close Quarter Battle House) and part of a Boeing 747 airliner that can be reconfigured to match the internal layouts of virtually any commercial aircraft. The on-call CT squadron is split into four troops, two of which are on immediate notice to move and are restricted to the Hereford-Credenhill area, whilst the other two conduct training and exercises across the UK, but are available for operational deployment should the need arise. The 22nd Special Air Service is under the operational command of the Director Special Forces (DSF), a major-general grade post. Previously ranked as a brigadier, the DSF was promoted from brigadier to major-general in recognition of the significant expansion of the United Kingdom Special Forces (UKSF). During Operation HERRICK the SAS Reserve were responsible for mentoring members of the Afghan National Police. Following a review of the unit's operational capability they were withdrawn from this tasking and the task handed over to a regular infantry unit. The report found that the SAS reservists lacked a clearly defined role and also stated that the reservists lacked the military capability and skillset to serve alongside the regular special forces. On 1 September 2014, 21 and 23 SAS left United Kingdom Special Forces and were placed under the command of 1st Intelligence Surveillance and Reconnaissance Brigade. Pen y Fan 2,907 feet (886 m) above sea-level. The location for the Fan dance. The regular elements of United Kingdom Special Forces never recruit directly from the general public. All current members of the UK Armed Forces can apply for special forces selection, but historically the majority of candidates have a Commando or Airborne forces background. Selections are held twice yearly, in summer and winter, in Sennybridge and in the Brecon Beacons. Selection lasts for five weeks and normally starts with about 200 potential candidates. Upon arrival candidates first complete a Personal Fitness Test (PFT) and an Annual Fitness Test (AFT). [nb 3] They then march cross country against the clock, increasing the distances covered each day, culminating in what is known as Endurance. 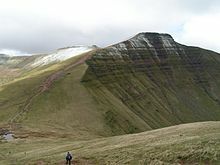 This is a march of 40 miles (64 km) with full equipment scaling and descending Pen y Fan in 20 hours. By the end of the hill phase candidates must be able to run 4 miles (6.4 km) in 30 minutes and swim two miles (3.2 km) in 90 minutes or less. Following the hill phase is the jungle phase that takes place in Belize, Brunei or Malaysia. Candidates are taught navigation, patrol formation/movement and jungle survival skills. Candidates returning to Hereford finish training in battle plans and foreign weapons and take part in combat survival exercises, the final one being the week-long escape and evasion. 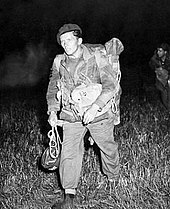 Candidates are formed into patrols and, carrying nothing more than a tin can filled with survival equipment, are dressed in old Second World War uniforms and told to head for a point by first light. The final selection test is arguably the most grueling, resistance to interrogation (RTI), lasting for 36 hours. In October 2018, recruitment policy changed to allow women to become members of the SAS for the first time. Normal barracks headdress is the sand-coloured beret, its cap badge is a downward pointing Excalibur, wreathed in flames (often incorrectly referred to as a winged dagger) worked into the cloth of a Crusader shield with the motto Who Dares Wins. [nb 4] SAS pattern parachute wings, designed by Lieutenant Jock Lewes and based on the stylised sacred Ibis wings of Isis of Egyptian iconography depicted in the décor of Shepheard's Hotel in Cairo, are worn on the right shoulder. Its ceremonial No 1 dress uniform is distinguished by a light blue stripe on the trousers. Its stable belt is a shade of blue similar to the blue stripe on the No 1 dress uniform. As an elite unit, there is a broad range of various firearms utilised by the SAS. Here are the known weapons used by the unit – some are made locally while others are imported from abroad. L119A1/A2 5.56x45mm – The UK designation for the Colt Canada C8SFW (Special Forces Weapon). UCIW (Ultra Compact Individual Weapon) 5.56x45mm – Shortened M4 Carbine with a maximum length of 22 inches and accepts 30 round M16/M4 magazines. Heckler & Koch HK33 5.56x45mm – HK33 and HK53 variants are used. Heckler & Koch G3 7.62x51mm – Uses the SG1 variant which features a special barrel, bipod, ergonomic stock, trigger group, and a scope which strongly resembles the Heckler & Koch PSG-1 while still supporting the standard G3 body style. Heckler & Koch G36 5.56x45mm – G36K variant has been used by the SAS in Afghanistan. Heckler & Koch MP5 9x19mm – various models used including the MP5K and MP5SD. MAC-10 9x19mm – Previously used by the SAS in Northern Ireland during the early 1970s and the Troubles. Browning Hi Power 9x19mm Pistol – Designation was L9A1 and was mostly replaced with the P226 pistols. SIG-Sauer P226 9x19mm pistol – Designation as L105A2 meaning it has a tactical rail for a flashlight and or laser attachment is warranted and replaced the L9A1. Glock 17 9x19mm – Designated as the L131A1 and is used also by the SAS. Glock 19 9x19mm – Used by plain-clothed operatives. Heckler & Koch HK417 7.62x51mm – Utilised as a marksman rifle. Accuracy International Arctic Warfare .50 Caliber – Utilised as a sniper and anti-materiel rifle. Remington 870 12 Gauge – Utilised with special breaching rounds which are referred to as 'Hatton Rounds'. The other main memorial is the SAS and Airborne Forces memorial in the cloisters at Westminster Abbey. The SAS Brigade Memorial at Sennecey-le-Grand in France commemorates the wartime dead of the Belgian, British and French SAS and recently a memorial plaque was added to the David Stirling Memorial in Scotland. There are other smaller memorials "scattered throughout Europe and in the Far East". The local church of St Martin's, Hereford has part of its graveyard set aside as an SAS memorial, over twenty SAS soldiers are buried there. There is also a wall of remembrance displaying memorial plaques to some who could not be buried, including the 18 SAS men who lost their lives in the Sea King helicopter crash during the Falklands Campaign on 19 May 1982 and a sculpture and stained glass window dedicated to the SAS. On 17 October 2017 Ascension, a new sculpture and window honouring the Special Air Service Regiment in Hereford Cathedral, was dedicated by the Bishop of Hereford at a service attended by Prince William. Ultimate Force - a 2002 television show that follows the adventures of SAS Red Troop. Who Dares Wins - a 1982 film with a plot inspired by the 1980 Iranian Embassy siege. ^ On 31 July 1947, the 21st regiment, SAS Regiment, (Artists Rifles) (Territorial Army) was formed. This was followed on 16 July 1952, when the 22 SAS Regiment was formed and the 23 Special Air Service Regiment (Territorial Army) was formed in February 1958. ^ The Regular reserve is made up of ex-soldiers who have a mobilisation obligation by virtue of their former service in the regular army. For the most part, these reservists constitute a standby rather than ready reserve, and are rarely mobilised except in times of national emergency or incipient war. ^ PFT —a minimum of 50 sit ups in two minutes, and 44 press-ups in two minutes and a 1.5 miles (2.4 km) run in 10 minutes 30 seconds. CFT — A march as a squad of 8 miles (13 km) in two hours carrying 25 kilograms (55 lb) of equipment. ^ a b c d e f Rayment, Sean (28 December 2003). "Overstretched SAS calls up part-time troops for Afghanistan". The Daily Telegraph. London. Retrieved 18 March 2010. ^ a b "Brief history of the regiment". Special Air Service Association. Retrieved 21 January 2011. ^ a b "UK Defence Statistics 2009". Defence Analytical Services Agency. Archived from the original on 10 June 2011. Retrieved 26 March 2010. ^ Moreton, Cole (11 November 2007). "Lord Guthrie: 'Tony's General' turns defence into an attack". The Independent. London. Archived from the original on 28 August 2009. Retrieved 18 March 2010. ^ a b "Prime Ministers Questions, Special Forces". Parliament of the United Kingdom. Retrieved 14 April 2010. ^ a b "Special Forces". Parliament of the United Kingdom. Retrieved 14 April 2010. ^ "The UK can't stay 'mum' over Russian bombing of Special Forces base in Syria - DefenceReport". DefenceReport. 3 August 2016. Retrieved 3 January 2018. ^ Army Briefing Note 120/14, NEWLY FORMED FORCE TROOPS COMMAND SPECIALIST BRIGADES, Quote . It commands all of the Army's Intelligence, Surveillance and EW assets, and is made up of units specifically from the former 1 MI Bde and 1 Arty Bde, as well as 14 Sig Regt, 21 and 23 SAS(R). ^ "Obituary:Lieutenant-Colonel David Danger: SAS radio operator". The Times. London. 31 March 2009. Archived from the original on 23 May 2010. Retrieved 28 March 2010. ^ "Obituary: Major Roy Farran". The Times. London. 6 June 2006. Archived from the original on 31 May 2010. Retrieved 28 March 2010. ^ "Society of Friends of the Airborne Museum Oosterbeek". Airborne Museum Oosterbeek. Archived from the original on 25 April 2012. Retrieved 3 November 2010. ^ a b "Obituary — Major Alastair McGregor". The Daily Telegraph. London. 3 October 2002. Retrieved 19 March 2010. ^ Rooney, David (28 March 2007). Mad Mike: A Life of Brigadier Michael Calvert. Pen and Sword. ISBN 978-1844155071. ^ Hawton, Nick (2 April 2004). "Karadzic escapes again as SAS swoops on church". The Times. London. Retrieved 21 March 2010. ^ Bellamy, Christopher (11 April 1994). "Ground attack is first in Nato history: British SAS troops help US war planes to deliver a timely warning to Serbs that 'safe areas' must be respected, writes Christopher Bellamy in Split". The Independent. London. Retrieved 21 March 2010. ^ "War in Europe: SAS teams `fighting behind Serb lines'". 16 May 1999. Retrieved 23 February 2015. ^ Harding, Thomas; et al. (24 August 2011). "Libya, SAS leads hunt for Gaddafi". The Daily Telegraph. London. Retrieved 26 August 2011. ^ Norton-Taylor, Richard (23 August 2011). "SAS troopers help co-ordinate rebel attacks in Libya". The Guardian. London. Retrieved 26 August 2011. ^ "Forze speciali in Iraq, caccia ai "Beatles"". la Repubblica (in Italian). 25 August 2014. Retrieved 17 September 2014. ^ Rebecca Perring (25 August 2014). "Parents of murdered US journalist release final letter he sent from captivity". Express. Retrieved 18 September 2014. ^ "Former ISIS hostage identifies Foley executioner". Al Arabiya. 21 August 2014. Retrieved 18 September 2014. ^ Rachel Browne (24 August 2014). "Rapper identified as James Foley's executioner: reports". The Sydney Morning Herald. Retrieved 18 September 2014. ^ "Breakfast with Frost, interview". BBC. 30 March 2003. Retrieved 27 March 2010. ^ "Insurgents 'right to take on US'". BBC. 3 May 2007. Retrieved 27 March 2010. ^ Thompson, Alice; Sylvester, Rachel (25 July 2009). "Guthrie attacks Gordon Brown over helicopters for Afghanistan troops". The Times. London. Retrieved 27 March 2010. ^ "Armed Forces:officers". Parliament of the United Kingdom. Retrieved 27 March 2010. ^ "History of New Zealand's Special Operations Forces". New Zealand Defence Force. 2 October 2014. Retrieved 1 January 2017. ^ "Special Air Service Regiment". Australian Army. 14 December 2016. Retrieved 1 January 2017. ^ Abbott, Peter, Modern African Wars (I): Rhodesia 1965–80, Osprey Publishing London, 2001, p.18. ^ "Special Forces Group". 9 December 2013. Retrieved 21 July 2016. ^ "History". sfg.be. Retrieved 3 May 2015. ^ "00". Retrieved 21 July 2016. ^ "Special Air Service Regimental Association – Units Represented". marsandminerva.co.uk. Retrieved 3 May 2015. ^ "The Belgian SAS in WWII – A Very Short History, website of the Belgian SAS Reenactment Group". Archived from the original on 16 August 2014. Retrieved 21 July 2016. ^ "1 Para: 1 bn Parachutisten Diest - ParaCommando.com". paracommando.com. Retrieved 3 May 2015. ^ "Demi-brigade de parachutistes SAS". Ministere de la Defense. Archived from the original on 3 May 2010. Retrieved 14 April 2010. ^ McDonald, Henry (23 December 2001). "Elite Irish troops on standby to keep peace in Afghanistan". The Guardian. Retrieved 15 May 2014. ^ "Philippine Special Forces Overview". ^ "UK Special Forces: Accountability in Shadow War – Oxford Research Group". Retrieved 21 July 2016. ^ Harnden, Toby (23 March 2010). "Gen Stanley McChrystal pays tribute to courage of British special forces". The Daily Telegraph. London. Retrieved 25 March 2010. ^ Finlan, Alistair. "The arrested development of UK special forces and the global war on terror". Cambridge University Press. Retrieved 17 March 2010. ^ "Regular Reserve". Ministry of Defence (United Kingdom). Archived from the original on 16 March 2010. Retrieved 4 June 2010. ^ "B Sqn 23 SAS". Reserve forces and cadets association. Archived from the original on 22 May 2010. Retrieved 18 March 2010. ^ "C Squadron 21 Special Air Service Regiment (V) Artists Rifles". Ministry of Defence. Archived from the original on 25 July 2010. Retrieved 18 March 2010. ^ "D Squadron 23 SAS (R)". Ministry of Defence. Archived from the original on 5 November 2010. Retrieved 18 March 2010. ^ "E Squadron – 21 Special Air Service Regiment". Ministry of Defence. Archived from the original on 2 December 2008. Retrieved 18 March 2010. ^ "G Squadron, 23 Special Air Service Regiment (R)". Ministry of Defence. Archived from the original on 16 October 2009. Retrieved 18 March 2010. ^ Evans, Michael (5 January 2008). "Special forces win the right to take their secrets to the grave". The Times. London. Retrieved 25 March 2010. ^ Sean Rayment. HOME»NEWS»WORLD NEWS»ASIA»AFGHANISTAN. published by the Telegraph Media Group Limited 11 Apr 2010. Retrieved 3 August 2015. ^ "PT booklet (PDF format)" (PDF). Ministry of Defence (United Kingdom). Archived from the original (PDF) on 10 December 2009. Retrieved 4 June 2010. ^ The Economist, Print Edition, 16 February 2019, page 66. ^ "Profile: The SAS". BBC News. 2 November 2001. Retrieved 9 January 2011. ^ Southby, Ewen. "SAS Weapons | Special Air Service". Eliteukforces.info. Retrieved 27 October 2018. ^ John 'Lofty' Wiseman. "SAS - Weapons - C8 Carbine". Eliteukforces.info. Retrieved 27 October 2018. ^ Mark Urban. "SAS - Weapons - Ultra Compact Individual Weapon | UCIW". Eliteukforces.info. Retrieved 27 October 2018. ^ Ross Kemp. "SAS - Weapons - HK33 and HK53". Eliteukforces.info. Retrieved 27 October 2018. ^ Southby, Ewen. "SAS - Weapons - G3 Assault Rifle". Eliteukforces.info. Retrieved 27 October 2018. ^ John 'Lofty' Wiseman. "SAS - Weapons - HK G36". Eliteukforces.info. Retrieved 27 October 2018. ^ Mark Urban. "SAS - Weapons - MP5". Eliteukforces.info. Retrieved 27 October 2018. ^ Chris McNab. "SAS - Weapons - Browning High Power Pistol". Eliteukforces.info. Retrieved 27 October 2018. ^ Craig Harrison. "SAS - Weapons - Sig Sauer P226". Eliteukforces.info. Retrieved 27 October 2018. ^ Craig Harrison. "SAS - Weapons - Remington 870 Shotgun". Eliteukforces.info. Retrieved 27 October 2018. ^ "Gulf Battle Honours". Parliament of the United Kingdom. Retrieved 26 March 2010. ^ "Telegraph style book: the Services". The Daily Telegraph. London. 12 April 2008. Retrieved 25 March 2010. ^ Staff (19 May 1980). "World: Britain's SAS. : Who Dares Wins". Time. Retrieved 9 January 2011. ^ "22 SAS Norry, Robert Keith". Retrieved 21 July 2016. ^ Collins, Tim (22 September 2011). "The making of the SAS, the men who dare". The Daily Telegraph. Retrieved 23 May 2012. ^ Staff. "Special Air Service Regimental Association". Retrieved 15 April 2010. ^ Phillip Brown. "Home – St Martin's Church Hereford". stmartinshereford.org.uk. Retrieved 3 May 2015. ^ "SAS Falklands dead remembered at service". BBC News. Retrieved 3 May 2015. ^ Ben Goddard. "Sculpture will be more relevant for today's regiment, says veteran's wife (From Hereford Times)". Herefordtimes.com. Retrieved 18 November 2016. ^ "Ascension memorial dedicated". Hereford Cathedral. Retrieved 5 November 2017. ^ John Nugent (11 April 2017). "First Trailer For Jamie Bell's Iranian Embassy Siege Drama 6 Days". Empire Online. Retrieved 5 June 2017. ^ "Ultimate Force". IMDB. Retrieved 25 February 2019. ^ "Who Dares Wins". Radio Times. Retrieved 25 February 2019. ^ a b Mills, T.F. "Special Air Service Regiment". Regiments.org. Archived from the original on 11 August 2007. Retrieved 4 February 2011. Adams, James (1987). Secret Armies. Hutchinson. ISBN 0-553-28162-3. Chant, Christopher (1988). The Handbook of British Regiments. Routledge. ISBN 0-415-00241-9. Davis, Brian Leigh (1983). British Army Uniforms and Insignia of World War Two. Arms and Armour Press. ISBN 0-85368-609-2.
de B. Taillon, J. Paul (2000). The evolution of Special Forces in Counter-Terrorism, The British and American Experiences. Greenwood. ISBN 0-275-96922-3. Edgeworth, Anthony; De St. Jorre, John (1981). The Guards. Ridge Press/Crown Publishers. ISBN 0-517-54376-1. Geraghty, Tony (1980). Who Dares Wins: The Story of the Special Air Service, 1950–1980. Book Club Association. ISBN 085368457X. Griffin, P.D (2006). Encyclopedia of Modern British Army Regiments. Sutton Publishing. ISBN 0-7509-3929-X. Kemp, Anthony (1993). The SAS at War 1941–1945. Signet. ISBN 0451174569. Molinari, Andrea (2007). Desert Raiders: Axis and Allied Special Forces 1940–43. Osprey Publishing. ISBN 978-1-84603-006-2. Morgan, Mike (2000). Daggers Drawn: Second World War heroes of the SAS and SBS. Sutton. ISBN 0-7509-2509-4. Ryan, Chris (2009). Fight to Win. Century. ISBN 978-1-84605-666-6. Scholey, Pete; Forsyth, Frederick (2008). Who Dares Wins: Special Forces Heroes of the SAS. Osprey Publishing. ISBN 1-84603-311-X. Silvestri, Enzo (2008). Thief in the Night. Lulu.com. ISBN 0-9798164-8-3. Stevens, Gordon (2005). The Originals — The Secret History of the Birth of the SAS in Their Own Words. Ebury Press. ISBN 978-0-09-190177-6. Thompson, Leroy (1994). SAS: Great Britain's Elite Special Air Service. Zenith Imprint. ISBN 0-87938-940-0.